As your local National Radon Defense dealer, Advanced Basement Systems is trained and certified to prevent radon gas from entering your home and alleviate a host of other pollutants. We also go through extensive training to understand and educate our customers about overall indoor air quality. The United States Environmental Protection Agency (EPA) categorizes potential indoor air risks in 5 Danger Levels. In addition to measuring and mitigating radon levels, we have solutions to reduce risks for all 5 danger levels, which includes particles, allergens, chemical pollutants, mould spores and high humidity. When you contact us for help, our professionals will educate you about your overall indoor air quality and if you have needs to improve your air, we can install a dehumidifier system, along with a combination of solutions. Call us today for an appointment. Our services are available in Chatham, London, Sarnia, Windsor and throughout Ontario. Fungus, including mould and mildew, can cause a wide variety of ailments. As these micro-organisms grow, they produce microscopic spores that can travel on air currents from their sources to all areas within the home. They are so tiny they can easily enter your lungs as you inhale. The reaction of sensitive individuals ranges from mild to severe. Symptoms include nose and throat irritation, nasal stuffiness, wheezing, eye irritation, skin irritation, shortness of breath, and asthma flares. Excessive mould has been linked to the development of asthma in children. For immunocompromised people, or for those with chronic lung diseases, there is greater risk of opportunistic fungal infections, according to the Centers for Disease Control and Prevention. Advanced Basement Systems’s strategies for reducing allergens and particulates include dehumidification and the installation of an electronic air filter or energy recovery ventilator in existing HVAC systems. Indoor air pollution includes airborne bacteria and viruses. Such contaminants are carried into the home by family members and pets. Infectious disease can include either bacterial diseases such as streptococcus, pneumococcus, and tuberculosis or viral diseases such as influenza, RSV, pneumonia, common cold viruses, and SARS. The health effects associated with this danger level are sinusitis, upper respiratory issues, throat and ear infections, bronchitis, and pneumonia. Advanced Basement Systems highly-effective air filtration solutions can reduce the presence of viruses and bacteria in your home. Give us a call at 1-844-320-1542 or fill out our free estimate form to schedule an appointment for radon testing. 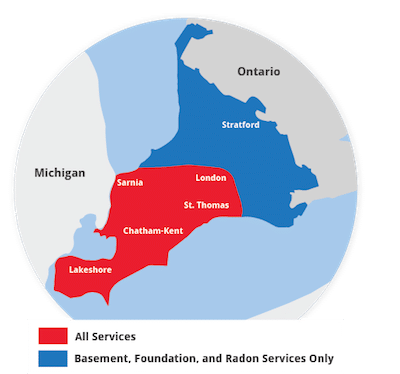 We are the trusted radon mitigation company in Windsor, Stratford, St Thomas, Leamington, Essex, Amherstburg, Strathroy and surrounding areas of Ontario.